Today is Three Kid Circus Auditions' spot on the Mother Talk Blog Tour for The Kids' Book Club Book , by Judy Gelman and Vicki Levy Krupp. I leaped at the chance to review this book. With summer looming large and two young, excited readers, I've wanted to put together a kids' book club for them - but I wasn't sure how to get started. Honestly, I am an avid reader, but I'm a lousy party planner. I like to talk about parties in the abstract, but when it comes to clever discussion questions, appropriate activities and perfect foods to serve, I'm a total loss. THIS BOOK SOLVES MY PROBLEMS! SERIOUSLY! From the opening chapter, The Kids' Book Club Book provides a wealth of information on how to get started, fund your club, choose great books, plan ahead, and keep members coming back month after month. Information gathered from successful children's book club leaders, libraries, bookstores and teachers is just part of the magic of this book. Gelmen and Krupp present 50 well-loved, award-winning titles to choose from, with age appropriate activities and recipes (often obtained from the author!) pulled from the pages of the book, or inspired by the theme. Everything is laid out in an easy to follow format. From recipes for the Dump Punch and egg salad sandwiches featured in Kate DiCamillo's Because of Winn-Dixie to instructions on how to make soap carvings like the ones left in a knothole of a tree in To Kill a Mockingbird by Harper Lee, The Kids' Book Club Book provides a bounty of ideas for making every kids' book club a success. I'm thrilled to have this resource at my fingertips as I begin to put together a club for my children and their friends. 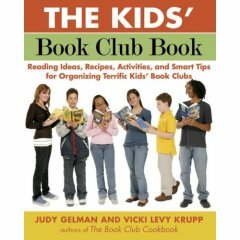 Judy Gelman and Vicki Levy Krupp also wrote The Book Club Cook Book : Recipes and Food for Thought from Your Book Club's Favorite Books and Authors. I'm eager to get my hands on a copy of that to share with my own book club. I have been pouring over the pages of this book with my kids, and we're all excited to get started. It looks like summer is going to be a literary success around here! For more from other Mother-Talk Bloggers, check out the reviews! Click here to order your own copy of The Kids' Book Club Book . 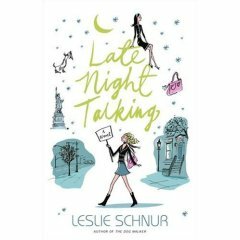 Three Kid Circus Auditions is today's stop on the Mother Talk Blog Tour for Leslie Schnur's latest novel, Late Night Talking . "From the acclaimed author of The Dog Walker comes Late Night Talking , a tender and funny novel about bad behavior, the fragility of friendship and family, and how we cannot choose whom we love." Jeannie Sterling, the main character, is a late night talk show host with a show that focuses on the rudeness and poor etiquette of others. She's gained a lot of popularity on the air, but her personal life isn't as neat and tidy as her online persona would indicate. Her free-spirit father returns and moves right in, bringing a smelly mutt with him. Her best friend is keeping secrets, and her new boyfriend is not what she expected. Add in a new boss who messes with the format of her show, and Jeannie is in a whole world of chaos. I found Jeannie's character to be charming and believable - she's often as rude as the people she pans on air, but is delightfully sanctimonious about it. The surrounding cast of characters are all well drawn and comfortable in their skins. Leslie Schnur writes great dialog, and keeps readers guessing. Like many novels in this genre, you can figure out where the plot is headed from the opening chapters, but the twists and turns that take you from point A to B make this a joyful read. would be a great addition to your beach bag this summer. 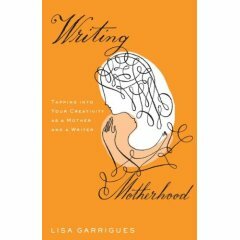 For more reviews from my fellow Mother Talkettes - check it out. 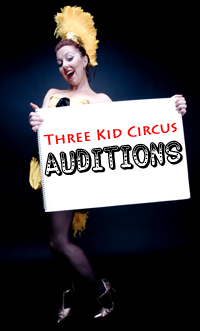 Three Kid Circus Auditions is today's stop on the Mother Talk blog tour for Sharon Epperson's The Big Payoff. This book, subtitled "8 steps couples can take to make the most of their money - and live richly ever after" is exactly what I needed to read. 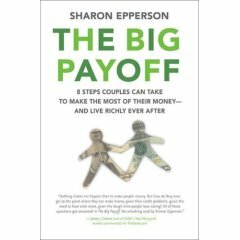 Each of the chapters in this book is designed to get you and your partner talking and thinking together about your financial life. Epperson soothes fears and stimulates discussion throughout, bringing confusing or frustrating topics out into the open. Everything is explained in lay terms, and illustrates her points with real-world stories that resonated with me. Starting with smart, easily-digested information, Epperson saves the lectures, and gets straight into the how-tos of budgeting, savings, debt management, investing for wealth, college and retirement, insurance and estate planning. Each chapter tackles a facet of financial wellness building onto the information already given. With plenty of examples and helpful charts scattered throughout, The Big Payoff demystifies the steps that are necessary to create and maintain a healthy financial picture, leading to a well-funded retirement. I really enjoyed reading this book, and came away eager to put Epperson's plans into action. Click here for more from the Mother-Talk tour. 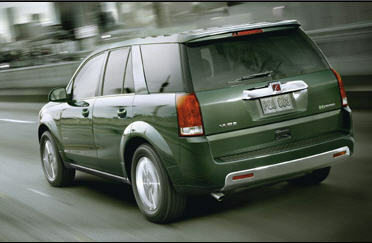 When I found out that the Parent Bloggers Network had arranged with Saturn to let me drive a Saturn Vue Green Line Hybrid for a week, I was excited. I practically tackled the delivery driver and wrestled the keys out of his hand. I got myself under control for a minute until they drove off in another sweet looking Saturn (which I would like to try out as well *wink, wink*) and then I grabbed the booster seat from my van and whistled for my daughter. We leaped into the Vue and after I buckled her in, we wheeled out of the driveway and down the road. "Mommy, this is a rockin' new car!" enthused my four-year-old. "Woo-hoooooo!" I finished, with a rather cheesy raised fist. Then I honked the horn twice. That right there is an accurate picture of how the rest of the week went. Lots of "wooooo!" Our instructions were to test out the Vue in real-world, real-family conditions. 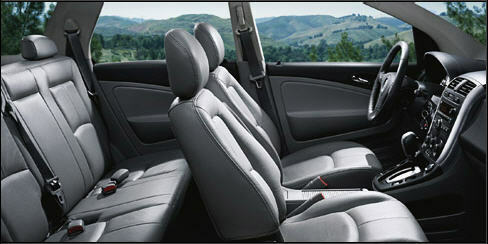 Aside from the one day that I allowed my husband to drive the Saturn to work - where he showed all of his co-workers and took clients to lunch in it - I used it for five school drop-offs, four pick-ups (where I made my friend Ren, who is an actual adult-sized person, check the leg and head room - he approves!) two Target runs, a grocery store trip, and lots of other running around town just for the "woooo!" of it. Through it all, the Vue was a dream - plenty of space for wiggly kids, lots of cargo space. Perfect for a family like mine. "Mom! I know why they call this a Vue! It has the best view of any back seat I've ever ridden in!" 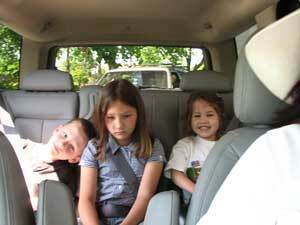 As much fun as I had, I would wager the kids had even more fun. They were thrilled at the ability to lower their windows and open their own doors, which my son cleverly discovered while we were driving at 35 miles per hour. After a swift talking-to about playing with the door handle, we engaged the child-locks on the doors, and we were back to cruising down the road. In fearful silence. Heh. Thank you to Saturn and the Parent Bloggers Network for allowing us to borrow the Vue for a week. We had a blast!